Nintendo had won me over on both the home console and portable fronts. When I heard of this kooky 3D console that introduced the idea of a virtual reality (VR) helmet, I had to have one. VR was a hot idea back in the day. Anything that offered an immersive experience was thought to be insanely high tech. Not everyone shared my enthusiasm. In fact, few people wanted to stuff their head into this thing to play a 2-color game... in red. Nintendo's Virtual Boy (also known as the VR-32 and Virtual Utopia Experience during development) was the first video game console capable of displaying "true 3D graphics" out of the box. Whereas most video games use monocular cues to achieve the illusion of three dimensions on a two-dimensional screen, the Virtual Boy creates an illusion of depth through the effect known as parallax. In a manner similar to using a head-mounted display, the user looks into an eyepiece made of neoprene on the front of the machine, and then an eyeglass-style projector allows viewing of the monochromatic (in this case, red) image. It was released on July 21, 1995 in Japan and August 14, 1995 in North America at a price of around US$180. It met with a lukewarm reception that was unaffected by continued price drops. Nintendo discontinued it the following year. This screenshot from Mario's Tennis is running on an emulator. The anaglyph red/blue format simulates the Virtual Boy's 3D display.3d glasses red cyan.svg 3D red cyan glasses are recommended to view this image correctly. The VB system uses a pair of 1×224 linear arrays (one per eye) and rapidly scans the array across the eye's field of view using flat oscillating mirrors. These mirrors vibrate back and forth at a very high speed, thus the mechanical humming noise from inside the unit. Each VB game cartridge has a yes/no option to automatically pause every 15-30 minutes so that the player may take a break. The Virtual Boy is iconic for its monochromatic use of red LED pixels; they were used due to being the least expensive, the lowest drain on batteries, and for being the most striking color to see. During development, a color LCD was experimented with but was found to cause users to see double instead of creating the illusion of depth. In addition, LCDs at the time had low refresh rates, and were often blurry. They also consumed more power than LEDs. The Virtual Boy, which uses an oscillating mirror to transform a single line of pixels into a full field of pixels, requires high-performance LEDs in order to function properly. Because each pixel is only in use for a tiny fraction of a second (384 pixels wide, 50.2 Hz scan rate = approximately 52 µs per scanline), high peak brightness is needed to make the virtual display bright and comfortable for the user to view. The two-screen system demanded a fast refresh rate, unlike the original Game Boy which had blurry motion, so using an LCD was not an option. The Virtual Boy, being a system with heavy emphasis on three-dimensional movement, needed a controller that could operate along a Z axis. The Virtual Boy's controller was an attempt to implement dual digital "D-pads" to control elements in the aforementioned 3D environment. The controller itself is shaped like an "M" (similar to a Nintendo 64 controller). One holds onto either side of the controller and the part that dips down in the middle contains the battery pack. There are six buttons on the controller (A, B, Start, Select, L and R), the two D-pads, and the system's "on/off" switch. The two directional pads are located on either side of the controller at the top. The "A" and "B" buttons are located below the pad on the right side and the "Start" and "Select" buttons are located in the same spot on the left side. What would normally be called "shoulder buttons" ("L" and "R") are located behind the area where the pads are, on the back of the controller, functioning more as triggers. Despite how the two D-pads were supposed to control elements in the 3D environment, both D-pads are interchangeable in most games like Mario Clash; both do the same thing. For others with a more 3D environment, like Red Alarm, 3D Tetris, or Teleroboxer, each pad controls a different feature. For Red Alarm, one directional pad controls pitch and direction of the protagonist's ship, while the other controls up, down, and strafe movement. For Teleroboxer, each control pad, in conjunction with the trigger/shoulder buttons, controls the position of the corresponding fist of the character. For 3D Tetris, The D-pads flip & move the blocks. The symmetry of the controller also allows games like Vertical Force to feature the option to reverse the controls for left-handed people (similar to the Atari Lynx). This kind of concession to left-handed people has been repeated with the Nintendo Wii console and to a lesser extent the Nintendo DS on some of its more touchscreen oriented games. One of the unique features of the controller is the extendable power supply that slides onto the back. It houses the six AA batteries required to power the system. This can be substituted with a wall adapter, though a "slide on" attachment is required for the switchout. Once the slide on adapter is installed, a power adapter can be attached to provide constant power. The system's EXT (extension) port, located on the underside of the system below the controller port, was never officially supported since no official multiplayer games were ever published, nor was an official link cable released. (Although Waterworld and Faceball were going to use the EXT port for multiplayer play, the multiplayer features in the former were removed and the latter was cancelled.) At Planet Virtual Boy there is a tutorial on how to make a multiplayer cable for the Virtual Boy by modifying a couple of standard Nintendo Composite cables. Currently, only a few games support the link cable. The console was designed by Gunpei Yokoi, inventor of the Game & Watch and Game Boy handhelds, as well as the Metroid franchise. While compact and seemingly portable, Virtual Boy was not intended to replace the Game Boy in Nintendo's product line, as use of the system requires a steady surface, and completely blocks the player's peripheral vision. According to David Sheff's book Game Over, Yokoi never actually intended for the console to be released in its present form. However, Nintendo pushed the Virtual Boy to market so that it could focus development resources on the Nintendo 64. "Powered by a 32-bit processor, the Virtual Boy produced very impressive 3-D effects, although the monochromatic graphic style proved to limit the appeal of the visuals." The commercial demise of the Virtual Boy was considered to be the catalyst that led to Yokoi being driven from Nintendo, yet it was maintained that Yokoi kept a close relationship with Nintendo despite Yokoi having later created a rivalling handheld system for Bandai. According to Game Over, the company laid the blame for the machine's faults directly on the creator. In 2007 the system was listed as number five in PC World's "The Ugliest Products in Tech History" list. 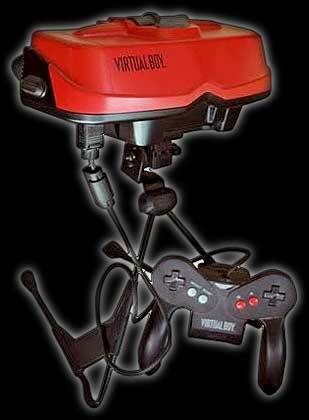 Nintendo quickly discontinued the Virtual Boy in late 1995 in Japan and in early 1996 in North America. Because Nintendo only shipped 800,000 Virtual Boy units worldwide, it is considered a valuable collector's item. Voice-overs for some advertisements were done by Dylan Bruno. There were several in-store promotional videos created for various games (as well as the Virtual Boy itself), and the system was actively marketed in magazines and on TV. The marketing slogan was "A 3D Game for a 3D World". Due to the short lifespan of the system, only 22 games were released. Of them, 19 games were released in the Japanese market, while only 14 were released in North America. View the entire Virtual Boy owner's manual.